There are several species of paper wasp and mud wasps (mud daubers) here in the Northwest, most of which are the signature black and yellow. Some black with a metallic blue hue. Each wasp is pretty easy to identify once you see their nest. Paper wasps make smaller nests out of wood fibers and are usually found under eaves or in the attic of houses and buildings. Their nests are open and the honeycomb shaped cells are exposed. The size of their nest ranges from the size of a dime to the size of your hand. In the spring, the queen starts each nest and raises all the workers. A large nest will average about 75 wasps, but most nests will have around 20 to 40 inside. At the end of their life cycle, the queen raises the next generation of queens for the next year. Those queens then find a place to hibernate for winter (usually your attic) while the original nest dies. The cycle then starts up again the next spring. 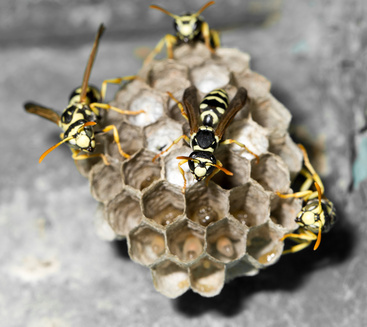 Paper wasps can reuse old nests, so you should make sure to knock down old nests from the previous year when you can. Paper and mud wasps are not typically aggressive, unless you swat at them or become a threat to their nest. If you were to encounter an aggressive paper or mud wasp, they can continuously sting you until they get tired, which is why wasp control is so important. Unlike the honeybee that loses their stinger after the first sting. We always recommend you call at the first signs that you have a nest in or near your home. Give us a call today to speak with one of our technicians about identifying which type of wasp or bee you have in your home and the best course of action for you and your home.